Review posted March 4, 2017. I'm going to say right up front that the only bad thing about this book is that it's apparently only Book One of a series. If I had realized that from the start, I might not have been so disappointed when the book stopped at an exciting place where the story is far from over. This book takes place on the enchanted Island of Fennbirn, favored by the goddess. It is the queens' 16th birthday. But there are three queens -- a queen who is a Poisoner, a queen who is an Elemental, and a queen who is a Naturalist. Each queen is supported by those of her kind, who have particular powers from the goddess. At Beltane, four months away, the queens will meet for the first time since they were children. There will be great ceremony and each queen will display her power at the Quickening. Then, in the next year, each queen will attempt to kill the other two. The last queen alive will rule over Fennbirn. There's a problem right from the start. Queen Katharine of the poisoners and Queen Arsinoe of the Naturalists have so far displayed no gift at all, unlike Queen Mirabelle of the Elementals, who is strong in her gift. But the families behind them aren't going to lose power easily. The author shows us each queen and her way of living, the people she loves and the plots around her -- and I found myself hoping that, somehow, all the queens will survive. Mind you, that still might happen -- like I said, the book doesn't finish the story. It takes us only up to the Quickening. Now the queens have a year to kill each other. But it's more and more difficult to imagine how things could end so tidily. The writing is wonderful. The author alternates between the three queens, but I never found myself impatient to skip one story -- each queen has a fascinating and tension-filled story as they all progress toward Beltane. We also learn much about their friends and foster families. Arsinoe has a friend with a cougar as her familiar. Katharine has a young man teaching her how to attract the Suitors who will come to court the queens. And Mirabella, surrounded by priestesses, does have loyal servants who help her when she dreams of when she was young and still with her sisters. The world-building is well-crafted. There's no exposition hell, with the details of this world skillfully woven into the stories. 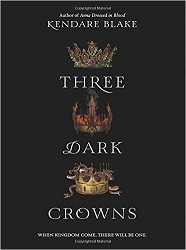 I will say that all three queens are still alive at the end of this book. And I desperately want to find out how long they will stay that way and what will happen next.